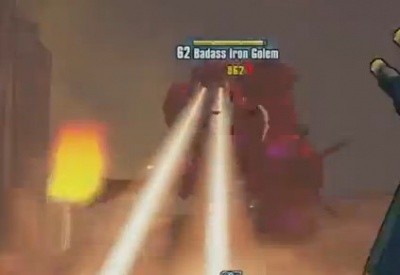 The Badass Iron Golem is an enemy in the game Borderlands 2. It can be found in the Mines of Avarice in the DLC Tiny Tina's Assault On Dragon Keep. This foe can shoot Lasers from its eyes. it also has a mace that it can throw at you or smash into the ground for an area attack. It possesses a sword it will swing at you on occasion as well. As an armored enemy they are very vulnerable to Corrosive-Type damage. They also have a critical hit point in their chest that is exposed during melee attacks. This page was last modified on 24 July 2013, at 16:55. Content is available under Creative Commons Attribution Non-Commercial Share Alike unless otherwise noted.